Pay-as-you-go (PAYG) enabled solar home systems and pico-solar products are rapidly expanding in market share, using new approaches to connectivity and emerging mobile money systems to provide low-cost financing for off-grid energy. The general principle is that end-users make ongoing payments for the system instead of paying cash up front, with confirmation of the payments through a range of approaches that generally use mobile connectivity of some type, either directly built-in to the energy system or via a mobile phone. The payments are due either until it is owned outright or in perpetuity in the case of energy service business models. If payments are not made in time, the system has internal circuitry to prevent its use, enforcing the loan or energy service payments. 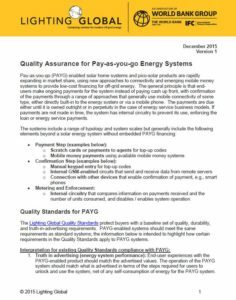 PAYG-enabled systems should meet the same requirements as standard systems; this policy describes how certain requirements in the Quality Standards apply to PAYG systems and what approaches manufacturers can take when a product is sold in both a PAYG-enabled version and a non-PAYG version.